Celebrated during Autumn at Smit, the cultural centre of the Khasi Hills, to essentially commemorate the evolution of Khasi indigenous democratic states called HIMA, which are still functioning today under the Sixth Schedule of the Indian Constitution when these states, earlier acceded to the Indian Union by signing the Instrument of Accession during 1947-48. 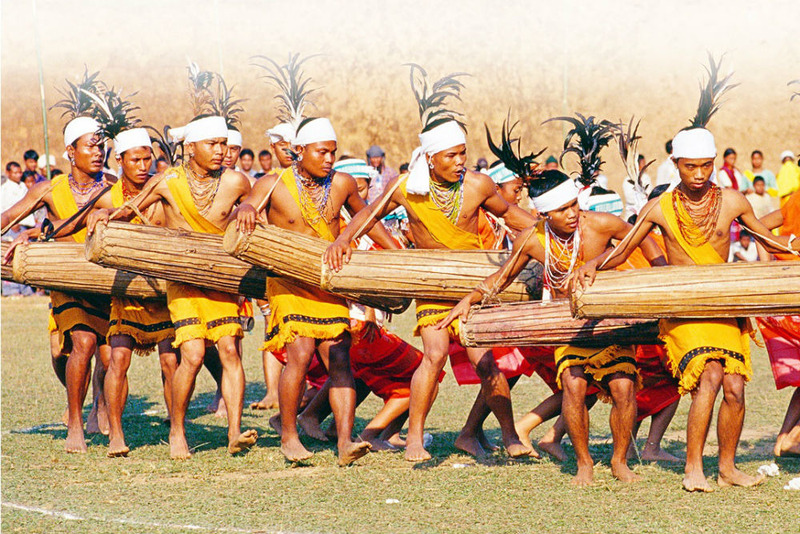 A colourful thanksgiving festival celebrated during springtime all over Khasi Hills. Virgins dressed in traditional finery and menfolk in colourful costumes participate in the dance to the accompaniment of drums and pipes called tangmuri, the queen of musical instruments. Celebrated during monsoon in July at Jowai and Tuber in Jaintia Hills. The festival features religious ceremonies and dancing at a pool called ‘eit nar’, including a football game called ‘datlawakor’. The ball in this case is a wooden ball. The festival is essentially to invoke the blessings of the Creator for a bountiful harvest and to chase away disease and plague. A major festival of the Garos, celebrated during Autumn, after the harvest season. The festival includes propitiation ceremonies to the deity Patigipa Rarongipa, held in every village. It is followed by other elaborate rituals for four days and nights, accompanied by dancing and merriment. It culminates in the warrior’s dance-the Dance of a Hundred Drums, on the final day which is a spectacular and delightful sight. Doregata Dance festival is another interesting dance where , while dancing the women try to knock off the turbans of their male partner using their head. If the women succeed, it is followed by peals of laughter. The Lahoo Dance is performed by both male and female for entertainment. Attired in their best finery, usually two young men on either side of a woman, holding arms together dance in step. In place of the usual drum and pipe, a cheer leader, usually a man gifted with the talent of impromptu recitation, recites couplets to the merriment of the audience.